Includes a Tooling Data Base with more than 30 special tools. CAMTEK Pacific has launched the PEPS CAD/CAM NC/CNC programming turning system. The programming turning module is a powerful tool to provide fast and reliable programming for the whole range of NC/CNC two and multiaxis turning machining centres of any maker with any NC/CNC control. Computer Aided Design (CAD) and Computer Aided Manufacturing (CAM) have became indispensable tools in the manufacturing environment of today. To benefit from NC/CNC technology, the computer software has to provide efficient and reliable NC/CNC programming. To make NC/CNC programming easy, the software has to be customised and the company's ‘know-how’ has to be known and used by a CAD/CAM NC/CNC Turning Programming System. The Melbourne company OZ Seals is a world wide recognised leader in NC/CNC turning of standard and special seals. After many years of working in a very specific niche it collected a unique ‘know-how’ with international marketing potential. The Open Architecture of PEPS allowed the company to build on OZ Seals’ knowledge based computer design and the NC/CNC programming turning system, the Seal Expert. Seal Expert has been developed by Camtek Pacific, the distributor of PEPS in Australia and South Pacific, in accordance with specifications provided by OZ Seals. All seals are predefined with three main conventional parameters - outside diameter, inside diameter and width. Depending on the type of the seal, further parameters are calculated per inbuilt formulas and rules. The seal is designed automatically and a drawing is displayed including all dimensions. The parameter dialogue box allows the user to adjust any parameter and billet sizes if required. The seal design and display are instantly updated. Along with standard tools, the Tooling Data Base includes more than 30 special tools. Tooling can be expanded as required. Machining methods are standardised and structured. Each seal type has a predefined machining method that resolves all necessary machining operations, tools and cutting feeds and speeds. As soon as design is approved, the system automatically generates a complete manufacturing procedure for the seal. The user can review the procedure and display machining of the seal on a computer screen in wire frame or solid simulation mode. 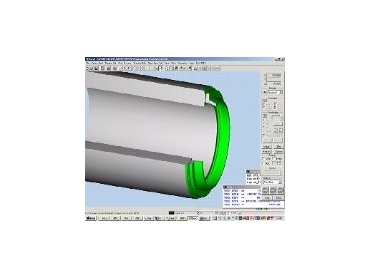 The user can modify the manufacturing procedure if required. As soon as the manufacturing procedure is approved, it is post processed and a set up sheet and an NC program are generated. "Typically it takes between two to three minutes for a standard seal from the first mouse click to having an NC program downloaded to the machine tool,” said OZ Seals machine tool operator, Concetto Palamara. OZ Seals’ integrated packages are installed in Australia, Austria, New Zealand, Spain, UK and USA. "Our experience in developing Expert applications using PEPS Open Architecture is very successful,” said Camtek Pacific managing director, Mark Goldfeld. “We invite companies to analyse their manufacturing environment and see us to evaluate advantages of their ‘know-how’ being implemented in their CAD/CAM System."